Summit Pack Goat continues to make new friends and send goats around the country. 2009 provided continued success for some, and some lifetime firsts for others. Enjoy the pictures as they share some of their experiences, and we toss in some of ours too. 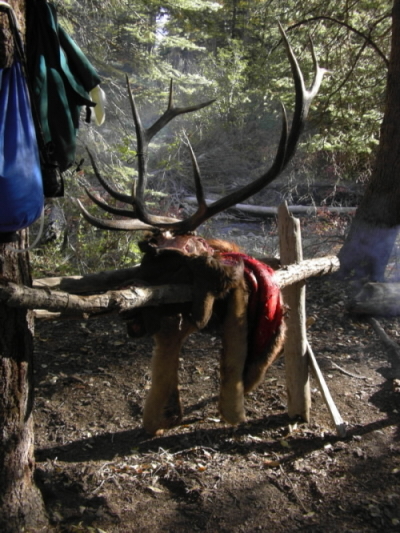 These elk, and those shown previous years, are all DIY(Do-It-Yourself), and on public land. Lane and his first elk, with Grandpa and Dad!! Look out bulls, Lane is coming soon! Here's some highlights from our own trip in 2009. Pat's first bull, a nice one too. 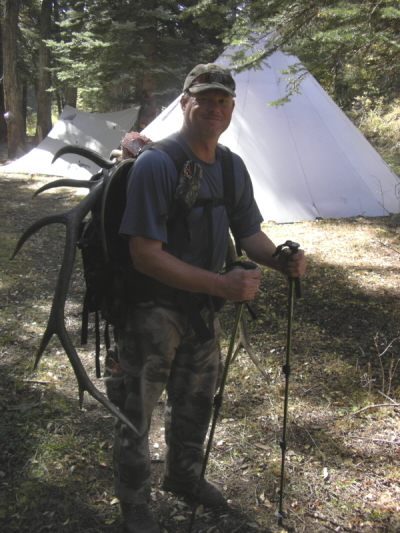 Four long time friends took part in our 2009 Colorado elk hunt. Linc and Hilg were able to take off on Wednesday. Truck and trailer loaded with gear and goats, they headed down the road, once a blown fuse needed for the trailer lights was fixed. 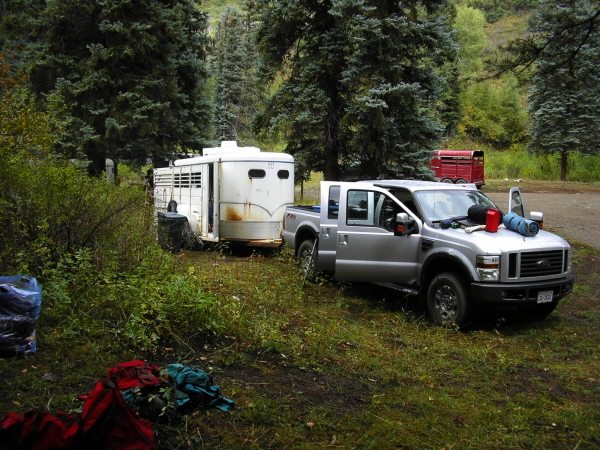 They got to the trailhead to find it packed with hunters and huge horse rigs, pretty normal, but this was the worse ever with hardly a place to park. They loaded up and made it to our campsite for the week in the glow of their LED head lamps. 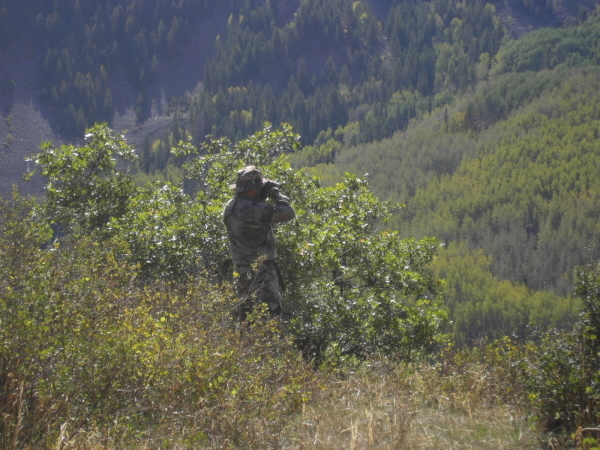 The Friday and Saturday morning hunts did not offer much, quiet bulls and no elk sightings. They brought the goats down to the trailhead for Pat and I to bring up our gear, food and beverage for the next week. We enjoyed an uneventful trip and found a trailer full of goats about 4:00a.m. After a few hours of sleep, we woke and began organizing for our trek to camp. Linc and Hilg heard a couple bugles on Sunday, but still not much going on. Pat and I got out Monday morning, one distant bugle and not an elk to be found. We took a different direction for our evening hunt. I found a nice ridge with a stretch of dark timber running along side. 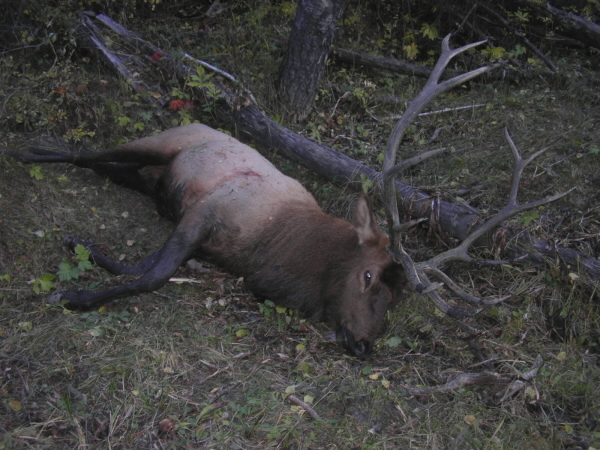 Lots of sign, tracks, rubs and droppings, but not elk. About sunset I see my first animal, a nice sized black bear walking by at 30 yards, coal black with a brown nose and nice hair coat that shined in the last minutes of sunlight. The next morning Hilg had early action with a bull working hard right at first light. The bull was soon only 40 yards away, bugling, chuckling, but too many trees blocked the shot. Once the bull lost interest he just walked away. Linc and Hilg's hunt ended on Wednesday night. They didn't have many encounters, not many bugles and Hilg's wayward shot Wednesday evening sealed their season with no elk. Pat and I had until the end of the season. Thursday morning we went to a high ridge where Linc and Hilg had heard some bulls. The elk appeared to have moved to the next drainage as we could hear distant bugles. We speculated that they would come back in the evening, Pat went back to camp to let the goats feed, I spent the afternoon waiting for the elk the come back. About 3:30pm bulls began to bugle, by 4:30 they seemed to be getting closer, the plan was coming together. I glanced to the North and knew I wouldn't see the outcome. The mountains that are usually on the horizon where hidden in a white veil of rain and sleet with the sounds of wind reaching me long before the weather. Not wanting to be stuck on the exposed ridge, I bundled up and made the wet hike back to camp. Friday was very warm with little action. That evening Pat and I revisted the area of our earlier hunt where Pat had missed the bull and cow. He did not see an elk, just a sow bear with a cub. I was blanked again. So far the only elk I've seen was a group of 12 cows and calves on Wednesday afternoon that were leaving the area a maximum speed. Saturday morning Pat and I split up. He took a loop in a high basin that has been good in the past, not an elk to be seen this year. My plan was to get high on the ridge and get between the elk that seemed to be dumping over into the next drainage everyday. 3/4th the way to the top and a bugle rang out. It was at my elevation, but a deep ravine separated us. I dropped down and made the climb back up. A cow call sent the bull to rounding up his cows and taking them up the ridge. I took after them, adrenaline helping my legs as I'd finally seen my first bull of the trip!! Soon, bulls are sounding off in all directions. I quickly had a bull at 80 yards, but he didn't want to come any closer. He left and I zeroed in on a herd bull above me with a dozen cows. 100 yards, 90 yard, 80 yards, too focused on my stalk, I missed seeing a satelite bull coming in from my left. He's got me pegged, let's out a bark and moves up the ridge. For the next two hours, I'm able to stay in the 80 to 100 yard range of many bulls and cows. Finally it's just me, the herd bull and 12 cows. He's tending his cows and circles the herd about every 15 minutes. He knows there should be a bull over where I'm at and each circle he comes 10 yards closer. Next I hear voices, cowboys pushing cows, they ride 300 yards below us. The elk all stopped, ears alert and didn't make a sound until the cowboys rode out of ear shot. Once they were gone, the bull went back to tending his cows as they browsed. I was feeling pretty good surviving the horse riders, now let's close the deal before the late morning winds become a factor. The bull circles, 70 yards, come on a little closer, then CRACK, BOOM and thundering hooves and the herd explodes off the mountain. What happened?? The wind is still good, the cowboys are gone, and where the elk once were a large black bear sow and cub casually walked. The bears busted the whole deal. 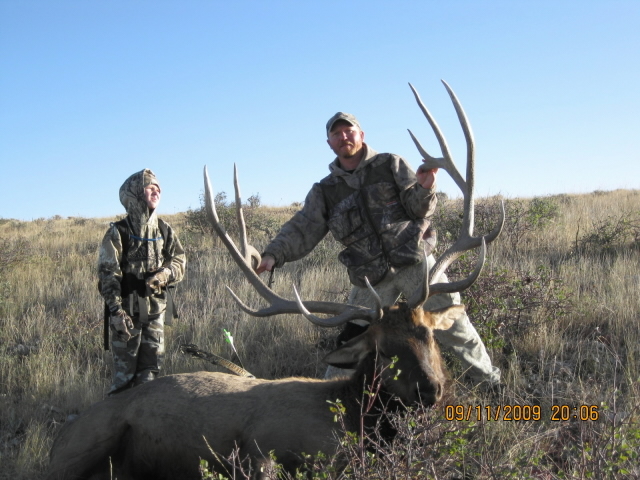 It was the hunt I needed, lot's of bulls, cows, bugles and close encounters, an arrow knocked for 2.5 hours. I climbed the ridge over looking the basin and reached Pat on the radio. He's on his way back to camp, so I spent the afternoon on the ridge. The afternoon winds were bad and it got hot. I started down late in the day, but with the swirling winds I knew I had little chance to making something work. Just after 6:00 my radio crackled, it's Pat with the words, “Bull Down! !” I asked, “Are we tracking?” Pat answered, “Nope, he's down.” I was only 1/3 of a mile away, so I made haste to get there in the light. Pat got goat chores done late. Short on time and late in the day, he went to a wallow near our campsite. He sat on a log for 15 minutes, heard a twig snap, looked over to see antler tips coming out of the brush. The bull came into the wallow area, chuckled and trotted over to the wallow and flopped into the mud. While he was down, Pat ranged him at 54 yards. Bull stood up, Pat stood up, put the pin on him and placed the arrow right on his spot. After a quick hop, the bull walked back the way he came in, stopped to look back at Pat and fell over. 17 steps is all he went!! I got there for pictures, ran the bows back to camp, got some more lights and we got his bull broke down and head and cape back to camp. The next morning, I went and loaded meat panniers while Pat caped his bull. We had 3-40lb loads, 3-30lb loads, and I tossed the 10lbs of meat left over in my pack for 220 lbs of boned out meat. 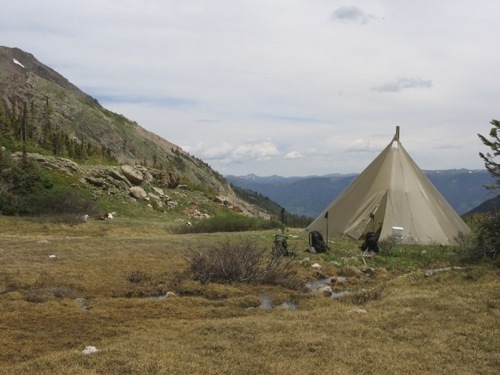 I got back to camp just as Pat finished the cape job, loaded up part of camp and made our first trip off the mountain. After a break at the trailhead, we went back up. Leading the tired group up the trail, I noticed something in the trail. Looked like a furry ball, and my mind was trying to figure out what it was. About 20 yards away, the animal turned its head toward me and I've got a close up look at a lynx. It was getting a drink of water with it's back to me and didn't notice us coming. I wish I had grabbed my camera as I could have gotten a nice picture. The goats were not happy about going back up, it was very much a force march at that point. We got camp packed up by sunset, then spent the next few hours packing out in the dark. Going back down went better, as they seemed to want to stay inside the glow of the LED lights. It was a long day with many miles on the trail, but we got the bull and camp off the mountain about 28 hours after Pat made the shot. Lot's of pretty Colorado country on the trip home, friendly folks giving Pat a” thumbs up.” We met some new people, some with mutual friends, it's a small world with large opportunities. 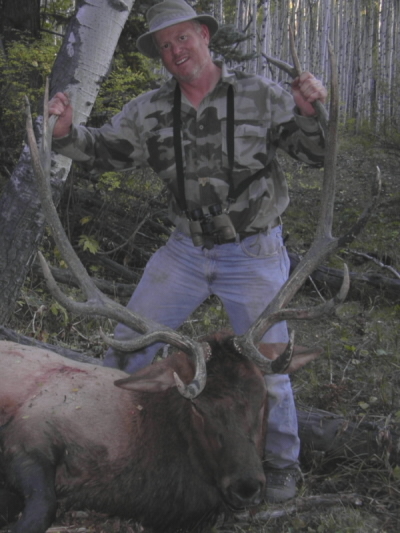 Pat has been elk hunting since 1993 and this is his first bull and second archery elk. He's experienced about every possible way there is to fail to get an elk. He's a humble man and would have felt just as blessed with the cow he missed earlier in the week. This time it all came together and I'm very happy for him.